The cost of direct materials is traced to each job through the use of a materials requisition form. When direct materials are issued to production, the materials requisition form identifies the job, the quantity and type of direct materials, and the cost of direct materials. Job time sheet or ticket is the source documents used to assign direct labor costs to jobs. When a direct laborer works on a job, he or she fills out a time ticket indicating the time spent on the job, along with the wage rate. Overhead is assigned to jobs using predetermined rates or Overhead Absorption Rate (OAR). If the rate is based on direct labor hours, then the predetermined rate and the information from the time tickets are used to assign overhead to jobs. A Furniture Mart received an order to manufacture furniture for a school the order was assigned a job code FS-6. FS-6 job was priced at Rs. 400,000 and selling & admin cost allocated to the job was 10% of selling price. >> Practice Product Costing Systems MCCQs. >> Practice more problems Process Costing Problems and Solutions. Jan 3, 2011. 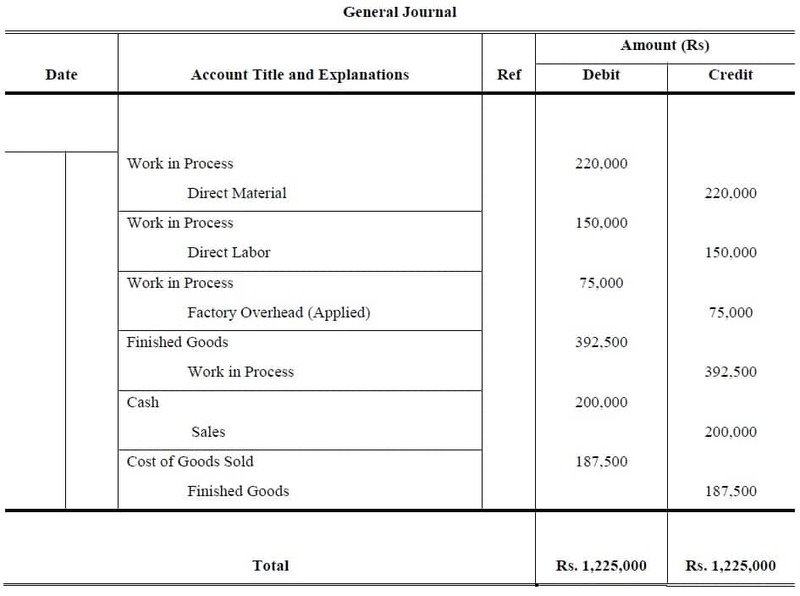 Raw materials were purchased on account for Rs. 200,000. Jan 6, 2011. Raw materials that cost Rs. 160,000 were issued from the storeroom for use in production. Of this total, Rs. 136,000 was for direct materials and Rs. 24,000 for indirect materials. Jan 9, 2011. The following costs were incurred for employee services: direct labor, Rs. 200,000; indirect labor, Rs. 85,000; selling and administrative wages and salaries, Rs. 90,000. Jan 12, 2011. Supplies costs of Rs. 40,000 were incurred in the factory. Jan 15, 2011. Prepaid insurance of Rs. 20,000 expired during the year (80% related to factory operations and 20% to selling and admin). Jan 18, 2011. Advertising costs of Rs. 10,000 were paid during the year. Jan 20, 2011. Depreciation was Rs. 145,000 for the year on factory assets and Rs. 15,000 on selling and admin assets. Jan 22, 2011. Manufacturing overhead was applied to jobs. The company’s predetermined overhead rate was based on the following estimates: manufacturing overhead, Rs. 315,000; direct labor cost, Rs. 210,000. Since the total direct labor cost incurred was Rs. 200,000. Jan 22, 2011. Goods that cost Rs. 650,000 to manufacture according to their job cost sheets were completed and transferred to the finished goods warehouse. Jan 25, 2011. Sales (all on credit) were Rs. 900,000. Jan 25, 2011.The goods that were sold had cost Rs. 600,000 to manufacture according to their job cost sheets. Overhead is applied at 50 percent of direct labor costs. Requirement: (a) Prepare Job Cost Sheet for three houses. (b) Pass combine journal Entries for this business assuming that Houses #1 and #2 are completed during the period and House #1 is sold for Rs. 200,000 cash. (c) Make T account for Work in Process account, Finished Goods Account and Cost of Goods Sold Account. Hello! I just want to give you a huge thumbs up for the excellent info you have right here on this post. I will be returning to your site for more soon.